Second, a sub-group of patients may benefit from a new drug that seems similar. This may be true or not, and we need to identify that sub-group so the effectiveness of the drug can be tested on them. The point of testing drugs for approval is to identify which patients might benefit and see if they do, not to assume that some patients somewhere might. Despite fewer superior drugs, Marc-André Gagnon has shown that sales and profits soared. Net return on revenues (ROR) rose from about 10 percent in the 1970s to 12.5 percent by 1990, to 16 percent by 2000, to 19 percent in 2010. Pharmaceutical ROR has increased from about 2.5 times to 3.2 times the return for the Fortune 500 giants, largely by raising prices and getting more physicians to prescribe more drugs. Risk for the major companies is much less than claimed for several reasons. First, they spread risk over many projects. Second, once inflators and public subsidies are taken out, net research costs are a fraction of the $1-5 billion per new drug claimed, and big companies largely invest after the public and others have paid for the high risks of research to discover new drugs. As new drugs enter clinical trials, their risks are just 1 in 5. Third, companies cut losses by stopping development of drugs whose profit potential is not as high as they want. We never will know how many beneficial drugs never get approved because companies dropped them for insufficient profit potential. Over the past 35 years, this hidden business model based on marketing power and prowess more than innovation has caused an epidemic of harmful side effects. Given estimates that about 30 adverse reactions occur for every one that leads to hospitalization, about 81 million adverse reactions are experienced by the 170 million Americans taking drugs. The elderly and those taking multiple drugs experience more than others. Most are medically minor, like muscle aches, gastro-intestinal discomforts, slower reactions, or sleepiness. But they reduce productivity and cause many falls and road accidents. 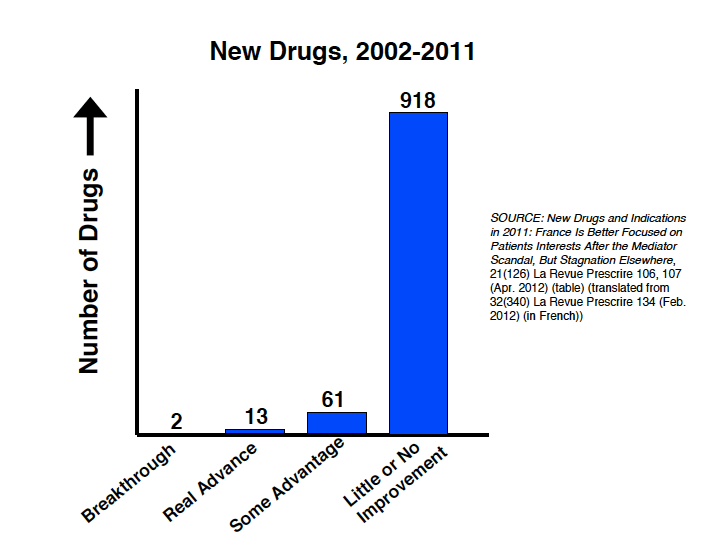 The pharmaceutical industry refers constantly to its “R&D pipeline” of new drugs under development. But there is a second, parallel pipeline – the trial-journal pipeline – that produces biased medical information on scores of new drugs to make them look scientifically more effective and safer than they prove to be in actual clinical practice. The Trial-Journal Pipeline consists of randomized clinical trials designed with the marketing departments to produce evidence that their drugs are more effective and safer than unbiased trials would show. Commercially funded clinical trials are at least 2.5 times more likely to favor the sponsor’s drug than non-commercially funded trials. The FDA accepts these biased trials and uses them to approve drugs. Congress strongly supports having companies fund the division that reviews new drugs rather than having the FDA be a publicly funded, independent reviewer and regulator. Financially, the FDA is an agent of the pharmaceutical industry, and it plays a major role in expanding markets for more people to take more drugs. For the journal part of the pipeline, pharmaceutical companies retain teams of statisticians, science editors, and science writers to select which results will go into the medical literature and which will not. They switch end points and other details in the trial data submitted to the FDA so that physicians read twice-biased medical articles that understate risks of harm and overstate benefits. Negative results are much less likely to be published than positive results, and companies publish positive results more than once, a further bias that distorts clinical practice and guidelines as well the medical knowledge that underlies it. This published literature goes into clinical guidelines and protocols. Originally, they were established to provide an unbiased, evidence-based way to practice good medicine. But Lisa Cosgrove and Emily Wheeler document how they have become “essentially marketing tools for drug companies.” They create “the potential to expose many patients to harm from unnecessary treatment or from treatment that is not evidence-based.” The situation is worse because the evidence is twice-biased and corrupts medical science. Companies then employ what Sergio Sismondo describes as “a two-step model of influence by hiring and otherwise enrolling some physicians and researchers who will, in turn influence many others” to prescribe the new, patented drugs. New FDA policies to get more drugs reviewed faster so that they can reach patients sooner in fact mean that drugs are approved with less evidence of being safe or effective. A systematic study of shortened reviews found that each 10-month reduction results in an 18 percent increase in serious adverse reactions, an 11percent increases in hospitalizations, and a 7.2 percent increase in deaths. This study complements the one that found the risk of serious adverse reactions occurring after fast approvals increases from 1 in 5, to 1 in 3. Congress and the public do not seem aware of this and other evidence that new policies that increase profits for drug companies put patients are greater serious risk. In response to drug disasters like Vioxx, which experts say caused about 120,000 traumatic cardiovascular events and 40,000 deaths, Congress and the FDA have set up monitoring and safety systems. But a review of results so far found little evidence they are identifying serious risks or altering prescribing practices. One key reform that would make new drugs safer and more effective would be to require that the FDA have evidence that new drugs are clinically effective. A top team at the London School of Economics concludes that requiring comparative evidence before approval informs all decision makers of the relative merits of new treatments. Also, it “could encourage manufacturers to concentrate on the development of new drugs in therapeutic areas with few or no alternatives.” While changing legislation is difficult, the FDA could use its administrative powers and guidelines to get more evidence that new drugs actually help patients before reviewing them. This is truly an enlightening article. It seeks to address a serious problem in a country which is well regulated and monitored.However in the Caribbean region for example some countries do even have a drug assessment process for registration. While others who do have registration processes the monitoring process are very weak or non existent. Hence it is important that newer, cost effective , sustainable strategies be developed and implement in the Caribbean region given these changes. Thank you for writing. Many countries operate in similar circumstances, and it seems to me that in the short run, their ministries of health care rely on one or more of the well-established, rigorous, independent review boards run in other countries, such as Germany, Australia, New Zealand, Scotland, or Canada. Germany’s IQWiG is proving to be the most thorough and also transparent. https://www.iqwig.de/en/home.2724.html Governments and insurers can draw on their advice. This can be supplemented by the detailed and practical assessments of Prescrire and the reviews by NICE in London of more costly medicines. Thank you for this illuminating blog post. I work part-time at a clinic in rural Massachusetts where the prescribing practices appear to be heavily influenced by visiting drug representatives, who bring free samples and provide lunch for the staff. Many patients are on multiple new and expensive medications, with costs ranging from $1K to $3K or more per month per patients. My understanding is that Medicaid, which pays for the drugs, is required to cover any FDA approved medication. It makes me think there’s another pipeline–the Medicaid to drug company pipeline whereby a vast stream of dollars moves from taxpayers to drug companies. This money could be so much better spent on raising Medicaid payments to the overworked prescribers and therapists!